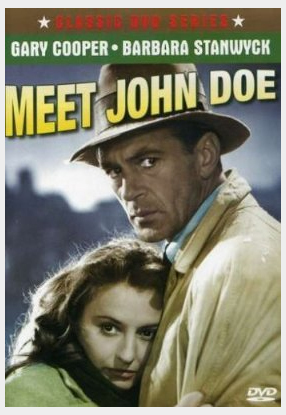 I got out my DVD of Meet John Doe after watching the “debate” between Joe Biden and Sarah Palin. In the 1941 Frank Capra film a cynical newspaper reporter (Barbara Stanwyck) creates a phony letter to the editor from a man who says he is so despondent over political conditions that he is going to commit suicide on Christmas Eve (Capra loved Christmas Eve as a movie motif). When the paper needs to produce this John Doe (Gary Cooper) is selected, an apolitical hobo who only cares about his failed baseball career. It’s a great fast-paced Capra film and you should rent it every political season. This year you might also want to rent Mr. Smith Goes to Washington (1939). In this one Jimmy Stewart is a Boy Scout leader from a rural state who runs for congress, wins and, when he gets there, finds it corrupted by career politicians. It also has a cynical newspaperwoman, but is famous for its filibuster scene. Along with Meet John Doe, this film encapsulates several attitudes about America and its politics that prevail to the present day. They also help to explain the phenomenon of Sarah Palin. Back around 1940 women were relegated to the non-political roles in both film and politics. These films are only two data points, but one wonder what might be made of the fact that Capra chose women to represent “the media” in both of these movies. Both are urban, cynical, and too smart for their own good. Typically (of Hollywood) they fall in love with the heroes in their film and figure in their righteous crusades (which, in today’s terms, would be the equivalent of Keith Olbermann falling for Sarah Palin). But suffice to say that the media were also vilified by politicians in those days. There is probably more to the media equals women equation than we could get into, but let’s save that one for later (or never). America has long been a country with an identity crisis. Our roots are in the soil; we started out mostly as farmers, not townsmen. Some of our founding father deeply distrusted cities. Jefferson called them a “sore upon the body politic.” We tolerated small towns because they were places where “everybody knew everybody else” sort of a gossip-driven behavioral policing system, and where you knew who were churchgoers, and family-values were the norm and people knew their place from their skin color. They were also places where vital farm-to-market roads led; American farmers were no interested in subsistence, but were capitalists who were interested in producing a surplus for profit. But contrary to these attitudes, by 1920, when Americans became predominantly “urban” in habitat, we have moved inexorably into the metropolitan age. In that process we have left behind that significant part of the American experience that was shaped by the small town. Scores and scores of small towns have withered and died, abandoned by their youth or economic bases, or bypassed by the freeways that connect the big cities. Others, swallowed by metropolitan expansion, struggle to preserve what small town identity remains. Today, for most of us, the small town is a place we know mostly through movies, novels and TV, and whose reality lies somewhere between often contradictory myths. One of these myths is of the idealized small town: an almost utopian preserve composed of “Andy Hardy” or “Our Gang” type kids playing happily on elm-lined streets with white picket fences. It has little red schoolhouses, town squares with band gazebos, the requisite general store and protestant generic clapboard church. Everybody knows everybody, perhaps too well, but it’s much preferred over big city anonymity. There are, in addition, the small town social archetypes: the pastor, the school marm, a town drunk and town floozie, the two old maid sisters who live in the big Victorian house on Elm street, the local constable, the publisher of the Elmtown Gazette, and, of course, the chorus of solid, small town families knitted together by unshakable allegiance to God, the flag, football or hockey, and extended-familism. There’s a host of people to whom we can credit these images: Regionalist painters, Samuel Clemens, sociologists of the early Chicago School, and Frank Capra films, among others. But more and more, such places exist (maybe only ever existed) in the nostalgia-misted recesses of the American mind. One reads or hears occasionally of a revival of small towns, of disenchanted stock brokers and corporation executives (and their wireless routers) emigrating from the hyper-urbanism of New York or Chicago to small towns in Vermont or Oregon in search of the grail of small townism, with its slower pace, small scale, and, if not love, at least know-thy-neighbor values. But the demographics soundly demonstrate that for most of us the metropolis is the habitat of choice or necessity. Perhaps, too, the rhapsodized reputation of the American small town has been tarnished by the same sources of myth-making that exalted it. Today, when we assay this bedrock of American idealism we find it adulterated with a mixture of myth, reality and revenge. While the mass media have given us the skewed romanticized perspective of the small towns of Andy Hardy and the Waltons they have also fed our imaginations on a staple of Peyton Place and the generic small Southern towns of mean-spirited, bigoted, xenophobic, reactionaries. Andy Hardy has grown up to knock up Sarah Palin’s teenage daughter or lead a gang of unemployed, sexually-frustrated small town youth ready to commit atrocities on any alien they can chase down in their gun-racked pickup trucks. It is unlikely that they would be deterred by the obese, cigar-munching sheriff who is blinded by his mirrored sunglasses to any malfeasance he can’t snare in his speed trap. Maybe this negative imagery has come about in the same way as the idealized myth of small towns–a modicum of reality made stereotype by our hopes for a promised land, or the loss of it. Maybe the negative image is as much the result of revenge on the small town for not having lived up to its mythology. And just maybe, some of us need to destroy the myth of the ideal small town to ease our urban discontent. After all, if Emerald City turns out to be a dreadful place, then there is indeed no place like home. What is more certain is that more and more of us will have to choose either myth from less and less real experience with the small town. More and more, our images of small towns will likely be formed by scriptwriters and novelists with little or no small town experience. But since myth-making is a proven staple of mass media, it is also fairly certain that, no matter how metropolitan or cosmopolitan we become, politicians like Sarah Palin will always try to tap into, if only in our imaginations, a small town somewhere in each of us. While you are renting those other Capra films you might want to rent (unless you have it memorized by now) It’s a Wonderful Life. Almost everything in the current political context seems to have a precursor in this 1946 film: there is the run on the Bailey family’s savings and loan bank; there is the difficulty of immigrant families assimilating into he community and affording homes; and there is the rich and greedy Mr. Potter, the equivalent of the present Wall Street “master of the universe.” You will see that what goes around comes around in American politics, but, doggone it, you will enjoy it more than those useless debates. All that is needed is a re-write if the films last line, spoken by little Zu-Zu to her father, Jimmy Stewart. I hear her now, “Every time a bell rings, a Wall Street Master of the Universe gets his golden parachute.” You betcha.